I always keep my thumb out of the way of a knife, in this case it's actually holding the knife while I'm taking the picture with my other hand. Start at least 6 cups salted water going in a fairly large pot. I found that the linguine actually soaked up a lot of water. Add the dried pasta to the water, after it comes to a boil. Slice the Red and Green Peppers into 1/4" x 1" strips, mince the onion, and place all into a pan with 1 tablespoon of butter..Cook this over medium / high heat until they begin to get soft. Add the wine, and turn the heat to high. When most of the liquid from the wine has evaporated, add the heavy whipping cream, and turn the heat down to medium. When the cream is hot, add the Parmesan Cheese, and turn the heat to low to wait for everything else to get done. If it thickens up too much, you can add a little more heavy whipping cream, or wine to thin it down a bit. When the pasta is cooked, drain it and add it to the pan holding the sauce, and mix it up to fully coat the pasta. Now add the chopped parsley, to give it that extra bit of color, and fresh flavor. Melt the butter in either a black frying pan, or a heavy bottomed stainless fry pan over a Medium high heat. When the butter's melted and the pan is pretty hot. add the chicken. I'm doing this at a friends house and am using an electric stove. I set the dial to #7 on a scale of 1 - 10 to get the proper temperature. You don't want to cook at too high a temp, or you'll end up burning the outside while leaving the inside still raw. 6. When the chicken is cooked, 4 - 6 minutes on each side, set it on paper towels to absorb some of the butter, and fry the other 2 pieces of chicken. When they're both done, slice them into strips and plate by setting the pasta on a plate, then setting the chicken on top. 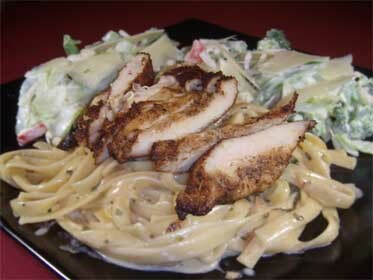 Or, after cutting the chicken into strips, you could mix it right in with the Alfredo Sauce.